Meet Annie! She's a senior at Westridge, the Head of Greek Activities on campus, and one of our Admission Ambassadors this year. I transferred into Westridge mid-year as a sophomore. 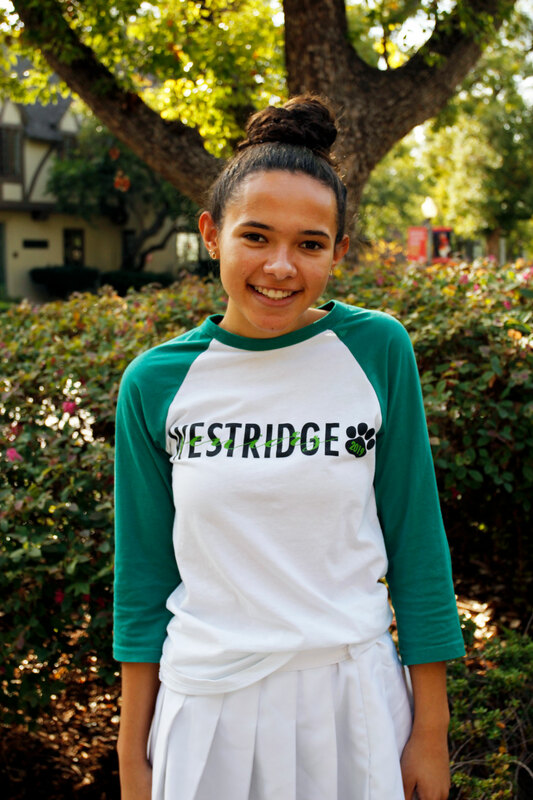 I’d applied to Westridge before in 8th grade and got in, but my sister was at a different school so I went there with her instead for a little while. But I think I always knew in the back of my mind that I wanted to go to Westridge, and when I did end up coming here, the transfer experience was really easy. The administration and my parents were a little apprehensive, not knowing if it was going to be a lot of work for me, but all my teachers made sure that I understood the material that I missed. They also put me in classes with at least one person I already knew from middle school, which was so nice. Westridge really supported me. What is your favorite part about being at a girls’ school? My first day in discussion in English class, I raised my hand to talk about an article we read. I was in a room full of people I didn’t know, and I felt totally comfortable. There was a clear difference for me (because of Westridge being a girls’ school); before, I’d been with people at my old school for a year and still never wanted to speak in class. There’s just no judgment from anyone at Westridge, and I love that. What is/was your favorite class at Westridge and why? I really liked my pre-calculus class last year. Throughout my school career, I’ve always said that I’m not a “math person” but when I took Dr. Busch’s pre-calc class last year, I really liked learning about the concepts he introduced. It made me think, wow, maybe I can be a “math person.” I can do well in a math course. It changed my trajectory. I’m a senior and I want to major in psychology in college, and classes like statistics are really helpful for that course of study. I pushed myself this year and took AP Statistics at Westridge. I’m doing well in the class, but I think if I hadn’t taken Dr. Busch’s class last year, I would have stayed in my comfort zone. Work on time management! Whenever people ask me about the homework load at admission events, it’s always difficult to answer because it depends on the person and their time management skills. I go to bed incredibly early and never stay up past 11 pm doing homework (and that’s really pushing it for me! ), and that’s because I do work during my free periods and take time to do work over the weekend. Even if you’re going into Middle School, that’s still a skill you’re going to need so it’s important to start working on it now. I’m so empowered when I’m here. Westridge has given me so many opportunities that I wouldn’t have been able to have at my other school. For example, I’m the Greek Activities Head [Editor’s note: Greek & Roman is a longstanding Westridge tradition in which the whole school is divided into two groups—Greeks and Romans. Click here to watch the video from our lighthearted “initiation ceremony” from this year!] and I run the Big & Little Sisters program with my friend Paloma—there’s nothing like that at other schools! Also, with affinity groups and Associated Student Body, the students get to be part of how the school runs. Student input is really important to the administration here, and we get opportunities for input at Westridge. If you’re looking for a school, you probably want a place where you can have your voice be heard, and sadly that doesn’t often happen in co-ed environments; a lot of times, girls’ voices are overshadowed by the boys’ voices. I think by being in an environment where everyone’s voice is heard, a lot of great things can happen. Also, with Big & Little Sisters, there’s such a connection between the whole school. That’s something that’s unique to Westridge. I have a fourth grader in my Big & Little Sisters “family,” and she likes to pretend that she’s the oldest one. We all laugh, but one day, she is going to be the oldest one in her family and get to mentor younger girls, and that’s so special. The ability for students to have a voice, make changes when we think changes are necessary, and speak our minds. I love that we are taught to advocate for ourselves. Also, there’s never been a teacher that I don’t feel comfortable talking to outside of class; they really care about you and your wellbeing.